http://www.line-stickers.com/ – Hari Raya Aidil fitri 2015 Line Sticker | Selamat Hari Raya Aidilfitri! Maaf Zahir and Batin from LINE Friends! Wishing you a cheerful Raya with your friends and family. Available till October 15, 2015. 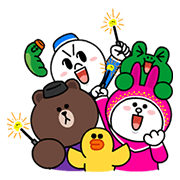 Previous post Celebrate Lebaran with LINE! Join us for Youth Support project!